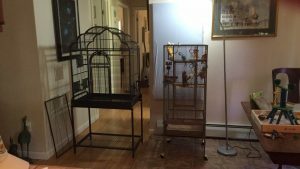 I know it’s completely excessive, but I own five cages (two of them flight cages) and only three birds! I swear there’s an excuse for every one. 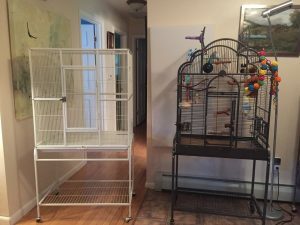 Since I’ve got a good range of parakeet cages, I thought it might help someone out to have a brief review of each one. They all have pros, cons and some have very specific purposes. Hopefully I can justify a portion of my over-spending by helping others make informed decisions! This was our very first bird cage. It met the minimum size requirement for parakeets (see size on link) and seemed to have some nice features. 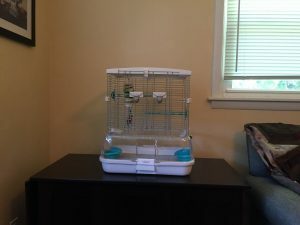 To be honest, before we got our first parakeet we weren’t too sure birds would be for us, and this cage could have also worked for a sugar glider. The Park Plaza is a very good solid bird cage with nice construction. I liked that the food and water bowls swung out with the access doors, making it easy to replace food and water without letting a not yet tame bird out of the cage. There is also a double lock on the front access door. The door itself has a nice large opening which was a big help for taming. We ended up replacing this cage because it was too low to the ground. Toby is not at all a ground bird and so ended up just using the top portion of the cage. She was fine with it, but it really wasn’t enough room to move or play. Also for a bird that spends several hours a day in their cage it just doesn’t have enough horizontal space for exercising. Another con is that when you take the grate out at the bottom, which we like to do so our parakeets can ground forage, it leaves a huge gap at the front which must be “patched” with cardboard. Not a huge deal for our Toby, who has never tried to escape anything in her life, but for a more intrepid budgie this would be a problem. Also, not shown are the seed catcher attachments, which we used for a while, and found that they really increased the footprint of the cage without much benefit. This is my favorite cage out of all five. It is incredibly well-made, and really attractive. I find that our flight cages are okay looking, but this cage looks like a nice piece of furniture versus something utilitarian. It’s not just appealing to the human eye, but also has many features that birds appreciate. The top opens for a great way to transition to the outside, there’s a wooden dowel perch included to keep the top open, otherwise it could slam shut which would be dangerous. We’ve weighted it with perches on the outside to make it heavy enough to stay open on its own. The area above the main access door also folds out for a porch-like area. Our parakeets get a ton of use out of the indoor/outdoor features. The food access doors on this cage are great too, you open the door and slide out the bowl, which is nestled in a “cage” of its own. It’s very easy to sneak bowls in and out of the cage without risking an escape. Speaking of which, you can also remove the grate without having to patch a gap, because of the included metal flap covering the area. There are a few cons to the cage – all the decorative curves make it a little harder to clean the crevices. 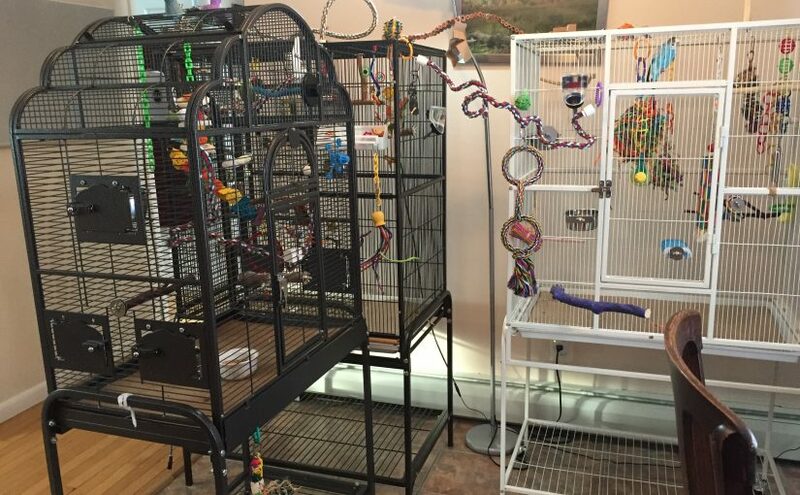 Additionally, because of the way the top opens it can be challenging to hang toys from the top of the cage, the way you would in a flat top cage. Because it narrows at the top we found it difficult to make a good place for multiple budgies to sleep, since they all like to be high up. For the size, this cage is also fairly expensive, $209 at the time of this posting. You can certainly get a bigger cage for a lot less money, but what you’re paying for here is the superior quality and the details. Even with the few cons, this cage edges out the A&E flight cage as my favorite. Out of the three largest cages we own, this is the one that I would least recommend. As soon as we took it out of the box we were disappointed by the quality. Several of the bars were bent and the finish was already nicked. The bent bars were pushed back into shape, but it was certainly telling how easy it was to do so. Also I like having a flat top to put out treats or toys, but this was so weak and bowed in it made me nervous putting anything remotely heavy up there. I thought I would dislike the brightness of the cage, but I actually didn’t mind that at all. It makes it easy to find soiled areas and clean them up. The size is really nice, but that’s about it. The food access doors are on spring hinges which would be dangerous for any budgie that might try to escape. Also, removing the grate at the bottom left a huge gap at the back. We used paper tape to cover it, which worked for Toby because, again, she’s never tried to escape anything in her life. But, there’s no way that Kelly could live in this cage, she’d be out in a second either through the food doors or the bottom. With Kelly’s propensity for bar-chewing she would almost certainly eat all the paint off this cage anyway. Overall I’m pretty disappointed with this purchase, particularly since a spend of just about $30 more got me much better quality for the next cage on our list. 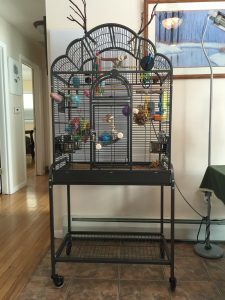 With similar dimensions and features, for just slightly more money, this cage is FAR better than the Prevue flight cage. The bars are much sturdier and the top is rock solid. I’m not a huge fan of the food access doors on this one either, but they have a tab lock that is at least secure, if not convenient. The space and the construction are very good, but there aren’t a lot of optional features to be found here either. Just a good solid flight cage with a lot of room. Taking out the grate does leave a gap, we were able to use the included dowel perch to fill the space and I’m still able to remove the bottom tray, so that worked out just fine. If you want a utilitarian flight cage with loads of room and really good finish and bar quality this is the cage for you. I almost forgot to include this cage because we don’t use it very often at all! I purchased the Small Vision cage for a few potential purposes. For the size, this cage was a real pain to put together! After having owned several relatively expensive cages, this is definitely a whole different animal. The bars seem very weak, everything else is made of plastic. I know a lot of people find the bottom tray very convenient for containing mess, but I can’t imagine having a bigger version of this and having to lift the whole cage top off to clean the bottom. I don’t like that the doors just fall open if you’re not careful when unlocking them. Overall this cage is fine for what we would use it for, but based on my feelings about this one I would never get a larger Vision Cage for a main cage. I know they are very reasonably priced and a lot of people love them, so no flames please! It’s just not my cup of tea. I do like that they are tabletop though, that seems like it would be great, since all of my main cages eat a ton of floor space. So, that’s a very brief review of our five cages. The two that we are currently using are the HQ Victorian Top and the A&E flight cage. The Park Prevue I think I’m going to donate to a bird rescue or see if there’s anyone else local who would like it. The Prevue Chalk White flight cage is currently taking up a ton of space in a spare room, I’m not sure what I’m going to do with that one! If you have any specific questions about these cages feel free to drop a comment or reach out through my Facebook page. I’ll be happy to help! I hear you about the seed catcher. Our grey’s cage came with one, and we never used it for space reasons, cleaning reasons, and the fact that I was nearly positive Willow would sit on the edge of it and relieve herself haha. Keeping up with cleaning (as much as that’s possible!) seems like a better solution to me than add-on cage parts or even those mesh wraps. Thank you so much for this post. 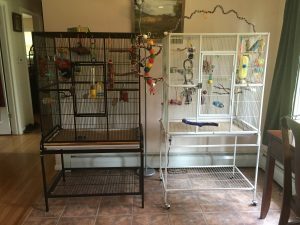 I have been going back and forth about which cage I want for my birds. I finally found one in Petco that is quite sturdy and best of all it is on sale. Thank you for all of your posts and advice. It helps so much. I’m so glad it helps! I hope your Petco cage works out well, score on the sale! !